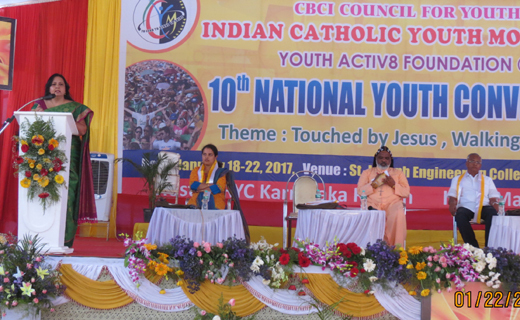 Mangaluru, Jan 22, 2017: The penutimate and 3rd day of the National Youth Convention, peaked with a Panel discussion on Entrepreneurial Leadership; Dr Jacob Crasta, Alan Dsouza, Vernon Mathias were the panelists while Bishop Henry D’Souza of Bellari moderated the discussion. Dr Jacob Crasta, an Indian entrepreneur, speaker, founder and CEO of CM Envirosystems Pvt. Ltd said “Failure can come from anywhere and anyhow, but it is up to you on how we face it and deal with it”. 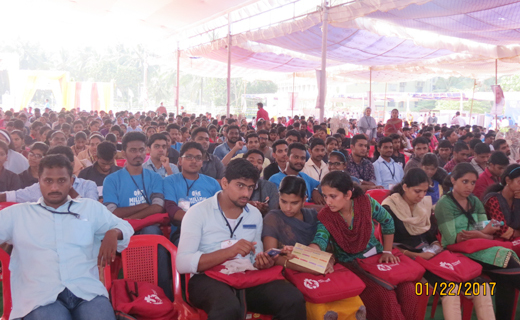 He encouraged youths to put dreams in brain and fire in bellies not dreams in bellies. Another panelist, a young entrepreneur Alan Dsouza, the CEO of Vavia Technologies told delegates “When you really want to win, the entire universe wants you to win but only by your thoughts and words”. Vernon Mathias, Director-sales & Marketing, Velvin group said “There is no standard formula for success. There can be lot of bad reasons to become an entrepreneur, but there may be one reason to become successful, the faith and belief in God as well as yourself”. 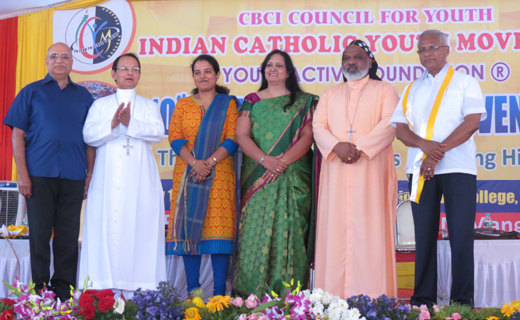 Earlier in the day Holy Eucharistic was celebrated in Syro-Malabar Rite. His Em. 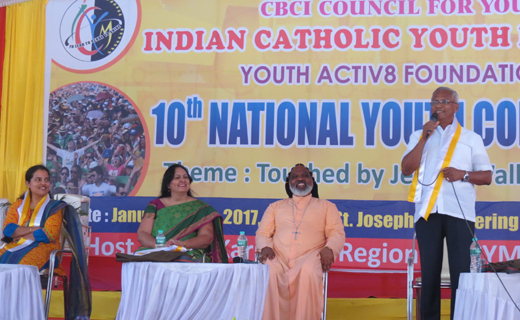 Cardinal G Alencherry presided over the mass. Later a presentation on DOCAT and YOUCAT was conducted by John Rhee. John Rhee from Germany while addressing the delegates of NYC 2017 shared his experience of Catechesis all around the world and also about evangelization. He said we need to have living relationship with Jesus by valuing sacraments as much as we value the Bible. DOCAT presentation was given by Jan-Philipp Goertz , the director for International and Government Affairs for Lufthansa Germany Airlines. He said”Everyone can be united under the name of Jesus and with any powers of the nations, companies or technologies, not because we use music or WhatsApp. If god wants we can have power, money etc., but if we do not have Jesus we have nothing”. He also highlighted why we need to know about the DOCAT and how to make a change in the world. Later in the evening the Gospel Band "Revelations" entertained and gave a spiritual experience to the NYC delegates. Note: The programme for January 22, Sunday (today): A Peace Rally from Rosario Cathedral to St.Aloysius College, followed by Holy Eucharist by Cardinal Gracias of Mumbai and Bishops with priests. Closing meet.